In an article published in ICIS magazine’s EPCA supplement October 2018, Dorothee explores how the economic situation of the European petrochemicals industry has evolved since the 2008 financial crisis. For further information, please read the full article. In a podcast interview with ICIS, she reflects on whether the new investment announcements in Europe herald a new wave of projects. Dorothee Arns also gave an interview to Ian Young from Chemical Week which appeared as the cover story in the latest edition of the journal entitled: “Bull run – Extended upcycle in Europe‘s petrochemical sector” published on 1 October. She explains the latest trends in Europe’s petrochemical industry, and the challenges it faces. Chemical Week: Several major petrochemical projects, including propane dehydrogenation plants, have been announced in 2017–18 for Europe. It is the first time for many years that Europe has seen capital-investment announcements in petrochemicals of this size. Why have conditions become favorable again for big petrochemical projects in this region? Dorothee Arns: Over the past four years, the overall conditions for petrochemical producers in Europe have been easing up; the oil/gas ratio especially has improved, and margins have opened up for European cracker operators. Demand has also increased, based on renewed growth in the region. As far as the projected investments are concerned, most projects announced address company-specific balance adjustments within their integrated value chains. CW: Despite the project announcements, there is still a competitiveness gap in petrochemicals between Europe and other regions such as the United States and Middle East. This isn’t only because of feedstock costs, but also high energy and regulatory costs in the European Union. What fundamental advantages does Europe have that can narrow this gap? Arns: Indeed, the lower oil price from 2014 onward has narrowed the competitiveness gap, but some structural challenges have remained. Fortunately, European petrochemical producers benefit from a whole series of competitive advantages—a high level of integration, large domestic markets with strong customer-industry clusters nearby, good infrastructure, and a skilled and motivated workforce. Additionally, a huge part of Europe’s cracker output is based on olefins other than ethylene, such as propylene and C₄ streams, which is an essential element of Europe’s broad chemical diversification. This wider portfolio range, together with the traditionally strong innovation efforts in Europe, will certainly help to generate new growth clusters, to solve the upcoming societal mega challenges, for example new materials. CW: Oil prices have risen in 2018. What difference has this made to the investment climate for petrochemicals in Europe? Arns: Petrochemicals are known to be a very capital-intensive industry, which implies that investment decisions are taken on long-term expectations. Any new plant is intended to be in operation for a couple of decades, and building costs—for example for a steam cracker—can easily exceed €1.5 billion. As far as the oil price is concerned, experience over the years shows that there have always been some fluctuations. Long-term oil price predictions of all the major independent international institutions, such as the International Energy Agency (IEA), suggest that oil prices are not likely to return to the high levels observed around 2013. Additionally, in recent years, the European petrochemical industry has largely increased its feedstock flexibility, and in fact several current investment projects are linked to non-crude raw materials—ethane and propane. CW: A big issue for the petrochemical sector is the lack of a common industry or energy policy in the European Union. What hope is there for an EU industry/energy policy, and what influence does the petrochemical industry have? Arns: It seems that competitiveness and growth have moved up Europe’s political agenda compared with a couple of years ago, and the current European Commission has raised several initiatives to tackle industry and energy policy. These are promising first steps, which will hopefully be followed up in the near future to maintain Europe’s traditionally strong industrial backbone, fully recognizing that it is very complex and quite a long journey to find optimal solutions that all 28 EU member countries can fully support. What can the industry do about it? Like all Cefic sectors, Petrochemicals Europe is constantly advocating for competitive energy prices, a fair reconciliation of Europe’s ambitious climate and growth targets, stable and predictable framework conditions, concrete measures to foster innovation and investments, and last but not least, cost-efficient regulation. It is worth stressing that cost-efficient regulation does not mean compromising on HSE standards— the industry is fully committed to complying with regulations. The question is only whether the same targets could be achieved with less cost, allowing European producers to compete successfully on a global level. 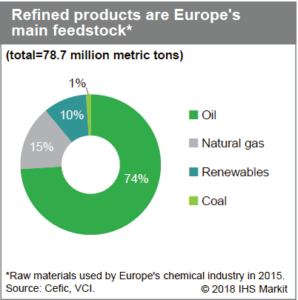 CW: What are the prospects and what is the true potential for making petrochemical products in Europe from renewable feedstock? Arns: The current situation is that Europe’s chemical industry requires 80 million tons of feedstock each year, 75% of which originate from fossil sources; at the moment, renewables make up 10%. The scale of fossil-based feedstock use makes it extremely challenging to substitute with renewables or biobased raw materials without running into competition for arable land with food, which is urgently needed to feed a strongly growing global population. Moreover, our competitive advantage here in Europe lies in a high level of integration and a tailor-made infrastructure, for example, zero-emission pipeline systems to transport raw materials. Both are very closely linked to the current raw material slate. The prerequisites for changing the existing system are big technological breakthroughs, which are not yet on the horizon, and huge investments in new infrastructure, which will come at a certain societal cost. Something else to consider when comparing these two raw material options is that biobased/ renewable does not by default automatically mean sustainable, and oil-based/fossil is not in principle unsustainable, contrary to what is usually implied in public debate these days. Full-life-cycle analysis results have shown that products and processes can be very beneficial in one specific environmental area, such as greenhouse gas emission reductions, but at the same time are suboptimal in other environmental areas, for example, energy-efficiency or water use. In this regard, it is worthwhile mentioning that the European petrochemical and chemical industry has not only substantially improved its own environmental profile over the past 25 years—from 1990 to 2015, about 60% less greenhouse gas emissions and 60% less energy consumption—but it also provides the products that enable its downstream users to significantly reduce their environmental footprint. In summary, from today’s perspective it seems likely that oil and gas will continue to feed the chemical industry’s value chains for the foreseeable future. At the same time, the current feedstock slate could well diversify further with renewables, biobased feedstock, and some alternatives finding their way into more specialty-chemical applications or new materials. It should be stressed that petrochemical producers in Europe take their environmental responsibility very seriously, which implies working on further reducing GHG emissions wherever possible and further enhancing circularity wherever feasible. CW: No steam crackers have been built in Europe for about two decades. INEOS announced recently that it is considering building a cracker in Europe. Do you believe that more crackers will be built in the region? What conditions are necessary for that to happen? Arns: All major studies show substantial market growth for petrochemicals worldwide, which is certainly linked to the fact that 95% of all manufactured goods are made from petrochemicals. To fully benefit from this opportunity, we here in Europe need above all access to competitively-priced feedstock and energy, predictable and stable framework conditions including cost-efficient regulation, a favorable business climate fostering innovation and the commercialization of new products, as well as a skilled, motivated, and talented future workforce.